Your weekend just got a whole lot better. Cancel any semi-fun plans you may have and get your friends together for a night with real edge as we celebrate the grand opening of Bad Axe Throwing Oklahoma City with our FREE open house! For those who want a quick lo-down: axes + awesome people + Oklahoma + FREE party = next level FUN. COST: Nothing because this is all FREE! RSVP: on our Facebook page! Bad Axe Throwing is the HIGHEST rated and BIGGEST axe throwing company in the world…and, we’re opening our newest location in your beautiful city. We’ve been featured on BuzzFeed, CNN, ABC and rated as one of the funnest activities on Trip Advisor in multiple cities. Seriously, you can take our word for it that Bad Axe Throwing provides you with a truly unique and amazing experience that you’ll want to relive again and again. Our roots are Canadian, which means we’re really nice, friendly folk who happen to be experts in creating pure, unrestricted fun with axes. We have over 9 locations across Canada, but we’re quickly growing in the U.S. too and we’re proud to add Oklahoma City to our roster which also includes Chicago and Indianapolis. In our opinion, there’s no better way to celebrate our mission to bring the great sport of axe throwing to our greatest neighbor than with a party! Come out, bring your brother, mother, lover, best friend, dentist, and colleagues to an event you won’t want to miss this summer. At our open house, you’ll learn the proper axe throwing technique from our expert coaches who will guide you every step of the way. Axe throwing is the perfect sport for anyone of any age. There’s no real skilled required, just a willingness to try something new. You’ll be taught how the scoring system works and you’ll have the chance to practice different throws (and maybe even try more challenging techniques like throwing two axes at once!). They’ll also teach you about all of our safety rules because we want everyone to feel super confident chucking steel blades at wooden targets. We promise once you feel the rush of your first axe throw, you’ll want to keep doing it all night! 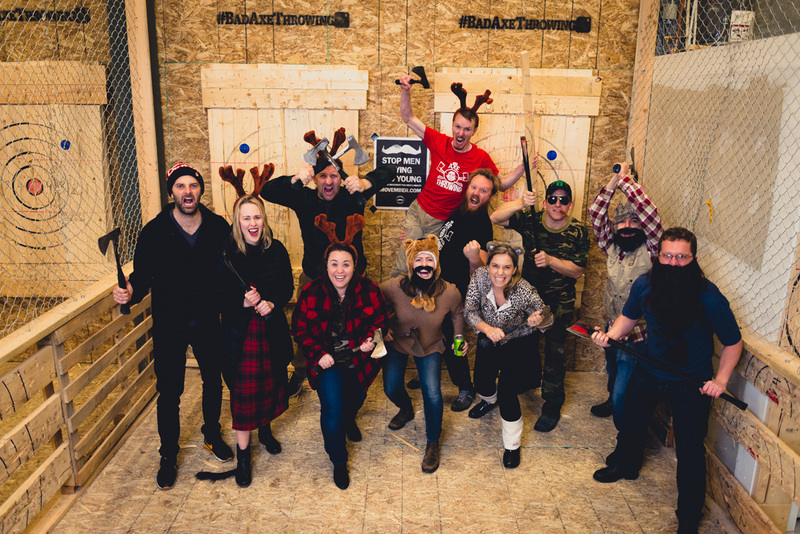 That’s why Bad Axe Throwing offers you the ability to book a session for any event, whether you want to celebrate a birthday, bachelor/bachelorette party, corporate event or have no reason at all but to enjoy a night with your friends! Our staff are pro party planners and can help you with any coordination or logistics, from setting up and decorating to food and drinks. Because we want everyone to have the best time possible, we also allow you to bring your beer to enjoy between throws! (Like we mentioned, we take partying seriously). Every group session is also hosted by a coach who will lead you and your friends in challenges, games and a round-robin tournament to determine the ultimate axe throwing champion. You and your friends will come away with insta-worthy photos as well as lifelong memories. Bad Axe Throwing is also the founder of the World Axe Throwing League (WATL) which includes members from 24 cities and Oklahoma will now be joining that roster too! The WATL is the global governing body for urban axe throwing and hosts major tournaments, namely the World Axe Throwing Championship. It’s open to everyone with a passion for the sport and we highly recommend you join when you want to take your axe throwing skills to a whole new level. It’s a great way to enjoy a new activity as well as meet like-minded people who we know will quickly turn into friends. We’re thrilled to be launching our Oklahoma City location and we hope you’ll want to come out and support us by throwing your first axe with Bad Axe Throwing. Try something new this summer and help celebrate us coming to Oklahoma City, we’d love to see you!